Carsten was a member of NNIT’s board for a number of years before becoming CFO at NNIT in January 2014. 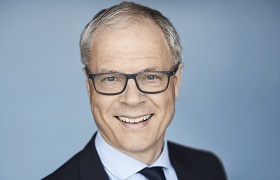 Carsten has extensive experience from management positions in Danish industry, most recently as CFO at Dong Energy (2002-2013) and CFO at DSB (1995-2002). “My mission here at NNIT is to create value for our owners and build on a solid business. It is also important to me that we create value for the company so that we can ensure a good workplace with room for continuous development. I am motivated by being a part of steering NNIT successfully through the exciting growth opportunities we have as a company – both in Denmark and abroad.